We don’t know what we want. We don’t know what’s best. We don’t know what’s possible. Other than that, our future of dog ownership is perfectly clear. We have been fated to cross paths with a fully worthy young stray (dropoff?) dog who has entered our lives unbidden, perhaps at random, perhaps ordained by the powers that both torment and reward. The rain—and feral dogs—fall on the godly and the ungodly alike. And so we face another full week until we can take Dingo to Christiansburg to be tutored. (Remember the Gary Larsen cartoon?) And yes, I know the perils of giving up a dog you’ve named or eating a chicken named Rosy. But there you have it. This dog first showed up in a burst of chicken terror, though the racket was not so much that he was after them as that they wanted no part of him. And Ann, mistaking him at first glance for a small bear, panicked; and I reflexively burst out the door in my underwear waving my arms and hollering, as Gandy chased the not-a-bear down the road at high speed. Said gray-black but otherwise vaguely-observed dog reappeared a few days later on the edge of the pasture, and then a few days after that. Each time I protected the free-range hens by firing the .22 into the ground. And yet the dog persisted, returning a day or two later. And cutting out all the in-between, last Thursday, when we concluded that we could get him to the animal shelter if we could pen him. We used Gandy as bait inside the chain-link enclosure under the shed roof. 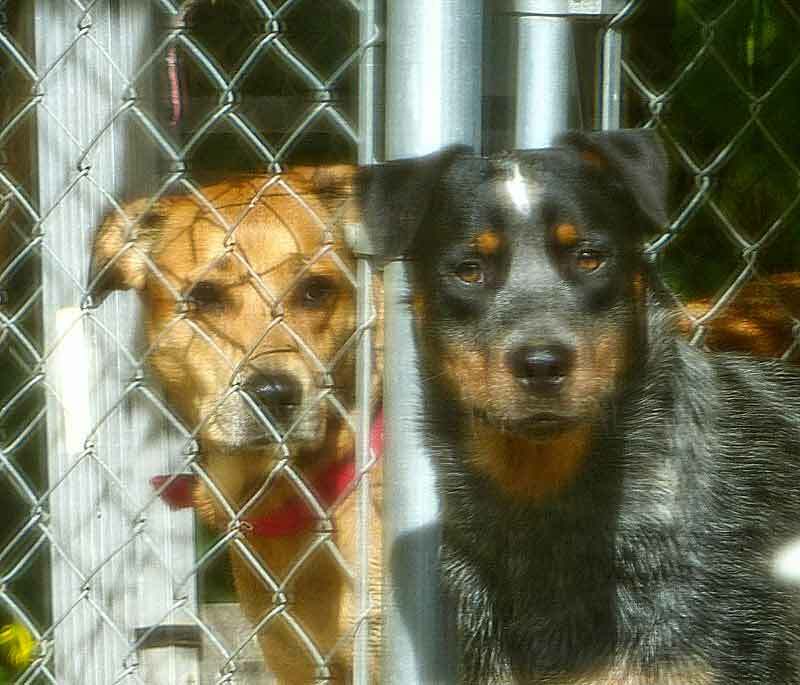 Within a few hours, the year-old blue heeler was himself inside the pen. So we called Animal Control to come fetch him to town, problem solved. What a relief! But no. We learned, to our dismay, that the facility is closed for repairs until at least Sept 11. No, there are no other places that will take him. And we do not need another dog. We can barely tolerate this temporary dog whose Little Brain so dominates his behavior any time our six year old (spayed) female is outdoors or visible inside the house. She keeps telling him in no uncertain terms that she is NOT that kind of girl! So we will try to endure this dysfunctional sorting of dog, chicken and people needs until Sept 4 when Dingo can get a shuttle from Floyd to Christiansburg to the Spay-Neuter clinic for de-balling. That SHOULD do wonders for his ability to concentrate on people and their instructions. He, however, will still be a puppy. This morning he carried both my Timberland boots out into the rain. He is a bright dog and wants to please, though he probably has had no training and little human affection, if any. He will “sit” for a puppy treat. He is faithful, staying very close in our walks around the pasture and sleeping on the back porch for five nights now. He has shown no aggression towards us or Gandy, though he was not sold on the large FedEx van yesterday, but gave the driver a pass when he tossed out a dog biscuit. But what are we going to do here? What is the best way forward for all? The cost (of shots, boarding, health issues); the hassle (of going through maybe another year of puppy-hood and training from scratch a year old dog; the inconvenience (of two dogs inside all winter long, wet feet and dog aroma for six months)—taking on any of this makes no sense. But then, dog ownership is not necessarily a rational choice. And we have not made a final choice yet, mind you. But I can read the writing on the wall. And I would be very surprised if Gandy doesn’t have a new best friend—if he can just keep his paws to himself. It sounds as if your fate is already settled. New things in old age are usually a tonic and pick me up. My very best wishes for it to be so! When a dog chooses you, you must relent and allow in the gift the universe has bestowed on you. I bet Gandy can handle Dingo eventually! It does sounds as if the dog has chosen you. I hope it turns out to be a good choice for all of you! It sounds like Dingo is training you well. His choice was made long before yours. I have to agree with your other commenters, Fred… happy to send a few pesos your way in Dingo’s behalf, and have been meaning to buy some of your terrific merchandise anyway! We are settled now in upstate NY; new info below. Keep in touch! Fred, Have missed your writings. They fill me up. I’ve missed hearing about Gandy. Now to my delight you have added Dingo to your family…most definitely he has chosen your family. Be glad to help with the costs involved. We can no longer have pets and miss them deeply. Write that dog book and watch it succeed MORE than Marley and me! !